Have you wanted to drive a sporty little coupe but thought you couldn’t afford it? Maybe you’ve dreamed of tackling the Inland Empire roads and making those tight turns from ground level as your tunes blast through a killer sound system. Sound good? Meet the 2017 Honda Civic Coupe in Fontana, CA, at Rock Honda. This peppy little car presents an athletic stance with its cool, compact exterior and offers plenty of comfort and your favorite tech toys in the cabin. 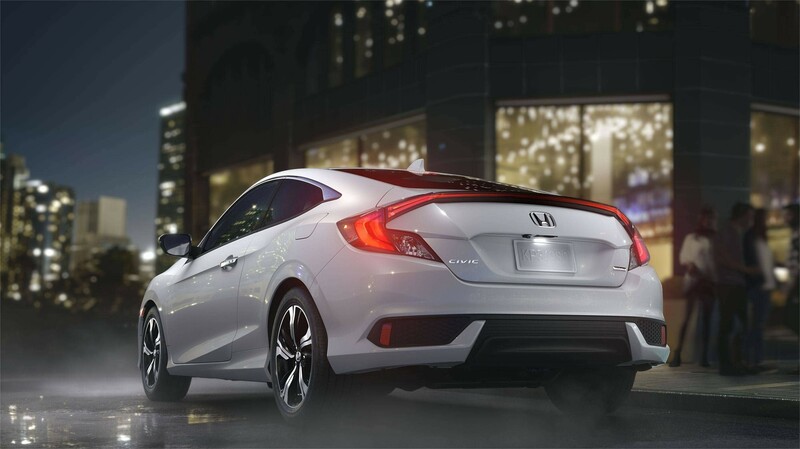 Come test drive a 2017 Honda Civic Coupe near San Bernardino, CA, at Rock Honda and find out how affordable this fun, fuel-efficient ride can be! Rock Honda has an incredible selection of 2017 Honda Civic Coupe models in Fontana, CA, with prices that will make you smile. We’ve taken the already super affordable prices and slashed them to get you a Rock Bottom deal. Whether your tastes lead you to the base LX model or you want to move into the more luxurious EX-T or EX-L, we’ll work with your trade, crunch numbers and come up with a deal that works with your budget. 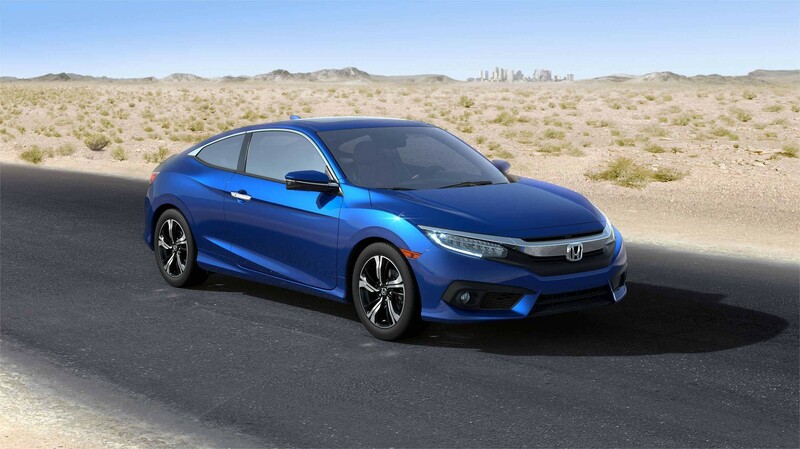 You can pre-qualify for financing and value your trade from our website, or stop by our showroom at 16570 South Highland Ave. in Fontana, CA, and browse our fantastic stock of 2017 Honda Civic Coupe models! Looking at the exterior of the 2017 Honda Civic Coupe you’ll be hard pressed to figure out how such a sharp looking coupe can be so affordable! Sleek bodylines that integrate aerodynamic side panels, available 17-inch alloy wheels, available LED headlights/available fog lights bookend a sporty, aggressive grille while C-shaped LED taillights that span the width of the rear deck lid gives eye-catching appeal. In the cabin of the 2017 Honda Civic Coupe you’ll find a very cool state-of-the-art instrument cluster, available leather-wrapped steering wheel/shift knob, front bucket seats with available leather and heat, lots of legroom for rear passengers and 60/40 split-folding rear seats when you need to pack in the swag. You’ll also find tech toys like an available Honda Satellite-Linked Navigation System™, Bluetooth HandsFreeLink®, multi-angle rearview camera, available wireless charging mat plus an available 450-watt 10-speaker premium audio system with subwoofer—everything you require for a great road trip! Under the hood of the 2017 Honda Civic Coupe is either a fuel friendly 16-valve DOHC i-VTEC® in-line 4-cylinder engine or 16-valve DOHC single-scroll MHI TD03 Turbo. The i-VTEC® churns out a healthy 158 horsepower and 138 lb.-ft. of torque while the Turbo model ups the oomph to 174 horsepower and 162 lb.-ft. of torque. The stock i-VTEC® is matched to a 6-speed manual transmission with an M-CVT automatic available. The Turbo engine is governed by a LL-CVT automatic transmission and delivers excellent performance when you’re zipping around the Inland Empire or near Rancho Cucamonga, CA. Check out the 2017 Honda Civic Coupe inventory near San Bernardino, CA, at Rock Honda and test drive a couple models from our huge inventory!